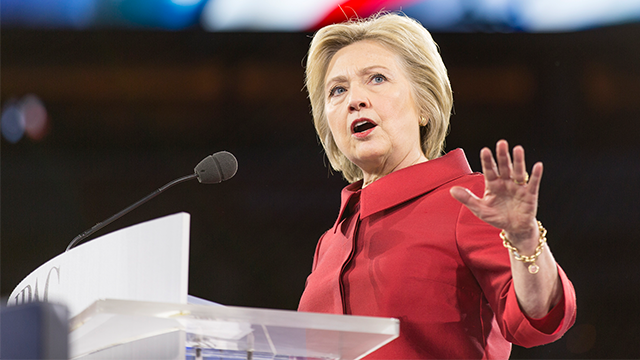 Hillary Clinton announced her tech and innovation plan in June. In it, she outlined an idea to defer student debt payments for entrepreneurs and even forgive some of their loans, if entrepreneurs start businesses in certain economically deprived communities. That idea of student-debt relief for entrepreneurs wasn’t the only thing in her plan. She also called for expanded wi-fi access nationwide and stronger protections for intellectual property for innovators, as well as for deeper investment in computer education to help build a tech-fluent workforce. And there was more. In her nomination acceptance speech, in fact, Clinton said entrepreneur twice and innovation twice and talked about teaching job skills and technology innovation. In his nomination speech, Donald Trump didn’t use any of those words even once. And he’s offered no plan related to technology, innovation or entrepreneurship, though it’s well known that entrepreneurship is the top source of new job creation. In fact, according to a 2011 report from the Kauffman Foundation, in the United States, “without startups, net job creation for the American economy would [have been] negative in all but a handful of years” since 1980. As the foundation's data shows, nearly all net job creation in the states occurred in companies less than five years old. So, if you’re looking for ways to boost job creation, entrepreneurship is a pretty important – maybe the most important – piece of the puzzle. As important as that point is – in my opinion – it’s not my objective here to be critical of one candidate for not being on the entrepreneurship bandwagon. Instead, I strongly support Clinton’s plan to delay or forgive student loans for entrepreneurs. Her idea is a new one; and, perhaps as a result, some pundits and academicians heavily invested in the status quo have been quick to criticize it. Actually, the idea that student debt is a roadblock to entrepreneurship has another wrinkle; research also shows that heavy education and debt burdens actually keep the parents of college graduates from starting businesses, too. Although the Clinton plan doesn’t address that issue specifically, clearly, easing student debt and education costs could have positive entrepreneurship ripple effects. Not that many of the pundits who are critical of the plan for debt delay for entrepreneurs have opposed the research; it’s common sense that if you have less disposable income for any reason, including student loan payments, you’re less likely to start a new business or be able to help that business succeed. Instead, much of the criticism has focused on how the plan could help the affluent, who already have money to invest in a startup, and that the plan helps existing entrepreneurs and those inclined to be entrepreneurs, a pool that is both heavily white and male. Here, the criticism seems to be that if a plan allows some people to be entrepreneurs who could not have done so without help, the plan is flawed because it might also help some who may not need it as much. There are, of course, pretty easy policy fixes to this, especially when it comes to financial advantage. If a student has student loans, he or she had to have filled out the FAFSA, the federal government's student and family income disclosure form. The FAFSA helps determine whether a student is eligible for federal need-based aid such as the Pell Grant. It determines what a family should be expected to contribute to a student’s college costs. So, linking the debt deferment to a FAFSA score would be possible. Secondly, it can’t be too hard to peg deferments and debt relief to a sliding scale of entrepreneurship participation based on gender, race or economic disadvantage. We do that already for many types of school aid. We can do it for entrepreneurship aid, too. As someone who’s spent much of the last decade trying to open people's eyes to the potential of entrepreneurship, I think that any way we can lower barriers and ease the process is a great idea. Moreover, anyone who’s ever started a business or worked with entrepreneurs (and I’ve done both) knows the process is anything but easy. So, what’s the knock on making that struggle just a bit less arduous? If Clinton’s plan, should she win the opportunity to enact it, helps just one entrepreneur get into the game instead of watch his or her dreams fade away, that’s a win. A big win. The next global employer will more than likely start with a single entrepreneur. This is the concept on which entrepreneurs and business leaders should embrace the notion of debt relief for entrepreneurs, even if it still needs some minor adjustment. At least there's is a plan out there that acknowledges that entrepreneurs exist, recognizes their role in the economy and includes ideas to spark more innovation and entrepreneurship. Frankly, that would as well be a pretty big win.